Good day! I’d like to ask you a question I’m eager to figure out: It has been tens of thousands of years since our ancestors Adam and Eve were expelled from the Garden of Eden after being tempted by the serpent into eating the fruit from the tree of the knowledge of good and evil. But we humans have never stopped longing for the beautiful life in the Garden of Eden. Then how can we return to the original life in the Garden of Eden? Hello! You’ve raised a crucial question that many brothers and sisters are concerned about. We all yearn for the life in the Garden of Eden, but how can we return to this kind of life? To answer this question, we have to go back to the days in the beginning. Why were Adam and Eve expelled from the Garden of Eden? At first, our ancestors Adam and Eve had been living in the beautiful Garden of Eden since they were created by God. But later, when the serpent enticed them to eat the fruit from the tree of the knowledge of good and evil, they defied God’s words and listened to the enticements of the serpent and sinned. As a result, they were driven out of the Garden of Eden by God. As Genesis 3:23-24 say, “Therefore Jehovah God sent him forth from the garden of Eden, to till the ground from from where he was taken. So he drove out the man; and he placed at the east of the garden of Eden Cherubim, and a flaming sword which turned every way, to keep the way of the tree of life.” It was because of sin that Adam and Eve lost the blessings of God. Thereafter, our sins become the barrier to our entering the Garden of Eden. So if we humans want to return to the life in the Garden of Eden, we must cast off our sins, and if we want to get rid of our sins, the only way is to accept God’s salvation. How did God do the work of saving man from sin? After mankind was seduced by Satan into committing sins, God started His management plan for the salvation of mankind. After the destruction of the world by the flood, God began to guide people, who at that time were just like newborn infants and didn’t know what committing a sin was and how to worship God. As God’s words say, “Prior to the two thousand years during which Jehovah did His work, man knew nothing, and almost all humanity had fallen into depravity, until, before the destruction of the world by the flood, they had reached a depth of promiscuity and corruption in which their hearts were empty of Jehovah, and even emptier of His way. They never understood the work Jehovah was going to do; they lacked reason, had even less of knowledge, and, like a machine that breathes, were consummately ignorant of man, God, the world, life and alike. On earth they engaged in many seductions, like the serpent, and said many things that were offensive to Jehovah, but because they were ignorant Jehovah did not chastise or discipline them. Only after the flood, when Noah was 601 years old, did Jehovah formally appear to Noah and guide him and his family.” At that time, in order to guide the Israelites to live on earth, God issued forth laws and commandments through Moses for man to abide by, which allowed man to know what sin was and how to worship God, and constrained man from sinning. However, at the same time as God is saving man, Satan has been constantly corrupting man. So although people at that time knew what sin was, they still couldn’t help committing sins. And at the end of the Age of Law, people sinned more and more and were all in danger of being condemned to death for breaking the law. God, however, took mercy on mankind. In order to save mankind from being condemned by the law, God was incarnated as the Lord Jesus to work among man. The Lord Jesus bestowed upon man the utmost compassion and love: He taught man how to confess and repent and how to bear the cross; He healed the sick and cast out demons, allowed the blind to see, the lame to walk and lepers to be healed, and even resurrected the dead. And finally He Himself was crucified for mankind as a sin offering, redeeming the whole mankind. After that, we humans have the qualification to come before the Lord to confess and repent and enjoy His bountiful grace. Yet, although the Lord Jesus has absolved our sins and no longer remembers them, it cannot be denied that we are still living in the cycle of sinning and repenting. That is because our sinful nature and satanic dispositions such as arrogance and conceitedness, crookedness and deceitfulness, selfishness and maliciousness are still deeply ingrained in us. Dominated by these satanic dispositions, we still frequently commit sins and resist God. For example, when our families fall ill or when we suffer tribulations, we could generate notions and misunderstandings about God and even complain to God; when it comes to matters that involve our own personal benefit, we could deceive others, fight and scheme with others. It’s evident from this that though we accepted the Lord Jesus’ salvation and were forgiven our sins, we still haven’t gotten rid of our sinful nature. God once said, “You shall therefore be holy, for I am holy” (Leviticus 11:45). From God’s words we know if we can’t rid ourselves of sinful nature, we are still filthy and unable to see the Lord, and surely we are unable to return to the life in the Garden of Eden. How can we get cleansed? Then how can we thoroughly break free of our sinful nature and get cleansed? I remember before the Lord Jesus was crucified, He promised that He would come again. And the Bible says, “Who are kept by the power of God through faith to salvation ready to be revealed in the last time” (1Peter 1:5). “For the time is come that judgment must begin at the house of God” (1Peter 4:17). Moreover, the Lord Jesus once prophesied, “He that rejects me, and receives not my words, has one that judges him: the word that I have spoken, the same shall judge him in the last day” (John 12:48), and “I have yet many things to say to you, but you cannot bear them now. However, when he, the Spirit of truth, is come, he will guide you into all truth: for he shall not speak of himself; but whatever he shall hear, that shall he speak: and he will show you things to come” (John 16:12-13). The Revelation also prophesied: “He that has an ear, let him hear what the Spirit says to the churches” (Revelation 3:22). From these verses and the words of the Lord Jesus, we can see that when God comes back in the last days He will express the word, telling us the things of the past and those of the future, and will perform the work of judgment beginning from the house of God. 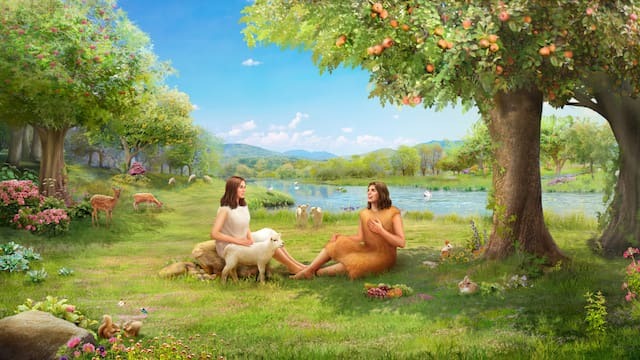 So only if we accept God’s work of judgment in the last days can we thoroughly get rid of sin and finally return to the beautiful life in the Garden of Eden. Sister Kelly, this is just my shallow understanding about this question, which I hope could resolve your confusion. And if you have any different opinion or new understanding about this, please share it with us. May God bless you! » Read more on our Articles on Bible Reading page, or click on the related articles below. Why Did God Say That David Was After His Will?